From the organizers: "Come join us for our annual Holiday Boutique and grab that one of a kind gift for someone special! 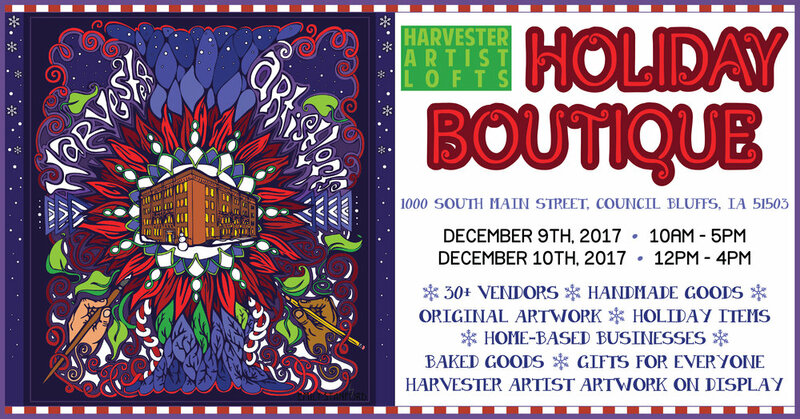 Several Harvester residents and outside artists, and home-based businesses will be joining us this year with a wide array of goodies. Pottery, paintings, jewelry, photographs, gift boxes, cards, and cookies are just some of the things you'll find while touring the halls of the International Harvester Building in Downtown Council Bluffs." Click interested/going, and you'll get automated reminders and receive updates of any news related to the show.